During WW1 the navy tried to develop “air torpedoes” – unmanned biplanes filled with TNT that would be catapulted over enemy lines and would vertically drop after a pre-determined distance. The end of WW1 saw the end of the program. In WW2 the Navy launched a program where pilots took off in explosive-laden B52s and then parachuted out of the cockpit, allowing the Navy to remotely control the planes from a separate aircraft so that the B-52s crash landed into select targets. The program was an abject failure. Germany, on the other hand, decided to put its faith in rocket technology. At the end of WW2 a lot of the German scientists that developed rockets for the Nazis came to further develop the same technology for the US Military in exchange for citizenship. This led to the era of cruise missiles. These can be thought of as proto-drones, with certain variants having the capability to be guided mid-flight and even to change targets once launched. However cruise missiles could not linger over a battlefield or deploy multiple weapons. This led to the development of the first wave of drones. The current generation of drones is in operation in countries ranging from Pakistan to Somalia today. 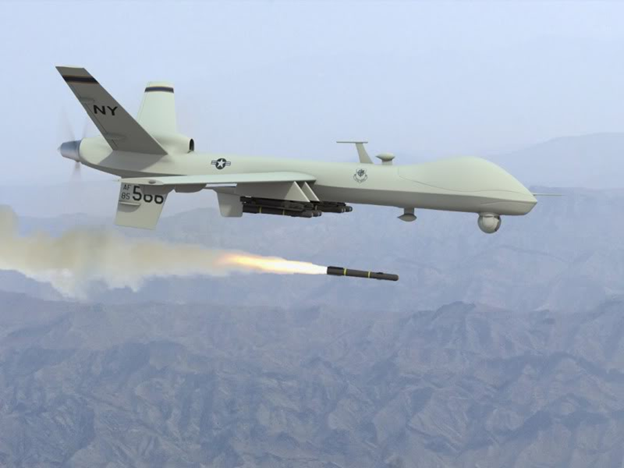 To read the wider article that goes into the bureaucratic infighting that preceded the development of the drones, the role that Osama bin Laden had to play, and the unfortunate naming choices that have contributed to the uncertainty that many Americans feel about the idea of drones click here.